Israeli soldiers abducted, on Sunday at night, two young Palestinian men, and shot two others, during ongoing military invasions carried out by the army in the az-Zawiya, Bruqin and Kafr ed-Deek towns, west of Salfit, in central West Bank. 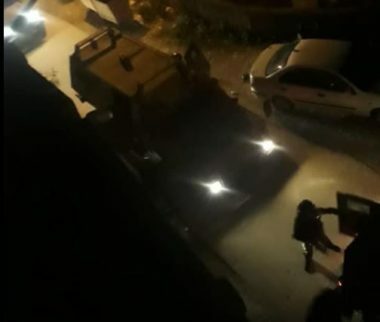 The soldiers invaded and violently searched dozens of homes in the three towns and interrogated many Palestinians while inspecting their ID cards. The soldiers also attacked many protesters with live fire, rubber-coated steel bullets, gas bombs and concussion grenades. Media sources in az-Zawiya said the soldiers searched many homes, and fired at dozens of protesters, shooting one with a rubber-coated steel bullet, and causing others to suffer the effects of teargas inhalation. In Bruqin town, the soldiers abducted Zakariya Mahmoud Samara and Abdul-Hafith Shafiq Abdullah, during searches of homes. The soldiers also shot one Palestinian with a concussion grenade in Kafr ed-Deek town, west of Salfit. It is worth mentioning that dozens of soldiers have been deployed around many Palestinian communities in Salfit governorate since morning hours, following the stabbing attack that led to the death of one Israeli soldier. At least twenty Israeli military jeeps invaded, on Sunday at night, the towns of az-Zawiya and Kafr ad-Deek, west of Salfit in central West Bank, and shot two Palestinians with live fire, in addition to causing many to suffer the effects of teargas inhalation. Na’im Shqeir, the mayor of az-Zawiya, said more than twenty Israeli military jeeps invaded the town while firing live rounds, concussion grenades, gas bombs and rubber-coated steel bullets. He added that the soldiers shot two Palestinians with live fire, and causing dozens of suffer the effects of teargas inhalation, in addition to various cuts and bruises. He added that dozens of soldiers were deployed around the town, and various Palestinian communities in Salfit, since morning hours, following the stabbing attack that led to the death of one Israeli soldier. In addition, the mayor of Kar ad-Deek town, Mohammad ad-Deek, said the dozens of soldiers also invaded the town, and shot a young man with a gas bomb in his face, while the Palestinians were protesting the invasion. He added that the injured young man suffered moderate wounds, and was rushed to a hospital for treatment. The mayor also stated that dozens of soldiers were still in the town, after isolating it from the surrounding communities, and added that dozens of villagers were unable to return to their homes. In addition, the soldiers stormed and ransacked many homes, and occupied their rooftops to use them as firing posts and monitoring towers. The soldiers also invaded Bruqin nearby town, stormed and ransacked many homes, and interrogated dozens of residents. In related news, the soldiers closed the iron gate which was installed by the army in Wadi ad-Dalb road, near the villages of Deir Ebzi’ and Kafr Ni’ma, and prevented the Palestinians from crossing, forcing them to take alternate, unpaved roads to their homes.